Here is the most recent progress picture for Millenium. I’m pleased with how it is stitching up. 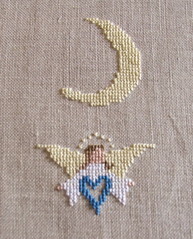 Baby Sampler – And stay by my bed side – Progress pic. edit: Hey! doesn’t look that bad on ze blog I’m taking a break from this piece as I need to grab some DMC 930 to finish it. 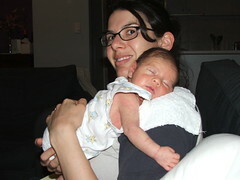 Here is the subject of the sampler with his beautiful Mum, my lovely sister Lucy. A recent Question of the week on the Mirabilia Board was “How has your stitching evolved over time?” I didn’t post an answer because I couldn’t honestly say I had evolved. But I was kidding myself. I’ve started stitching a sampler for my new nephew Niall and I hate it. It has 5 colours that are handdyes and I don’t know if it is threads are not showing the colour variation enough or what it is exactly but I’m not enjoying it at all! I forced myself to work on it yesterday afternoon after work and then in the evening I gave myself the treat of finally making a start on Theresa Wenzlers Storyteller (Which was a kit I bought years ago with new fabric I’ve subbed in – not going to fall for that one again). I’ve started with the border first and have made reasonable progress. This piece is supposed to be my focus piece in my rotation so I find it ironic that I’ve just made a start on it.